Production process of making noodles: It is said that noodle originates from China, and has a long history, and then it is introduced and adopted by other countries for its delicious tastes. Now noodles is a kind of staple food for a long time. With the development of society and technology, noodles manufacturers often use noodle making machine to produce large capacity noodles. People rub the wet dough into noodles like the size of fingers, and hang in the wooden shelves, after putting a short round stick, the coarse noodles can be turned to tiny and long, with natural wind, it turns out to be dried noodles, it has been popular among people because its good taste, convenience, low price, and easy storage, and the production technology has been inherited. With the time passing, the ancient small-workshop production model cannot adapt to the development of dried noodle industry. The paste machinery starts to be adapted widely in the rapid development of food industry. The method of natural drying was eliminated first, and followed by indoor drying. 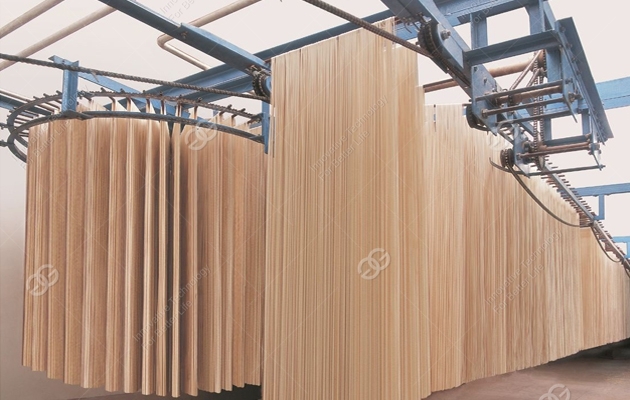 Therefore, the production of dried noodles is not influenced by weather any longer, and the adoption of drying machine can decrease the pollution of paste to a great extent, which can improve the quality and security of products. Therefore, the noodle making machine appear in various noodle producing workshops or enterprises, which lays the foundation for the mechanization level of noodle production line. Afterwards, the adaption pace of dough making machine, noodle pressing machine and noodle hanging machine is accelerating. The prospect of automatic dried noodle production line is brilliant, if you want to purchase our noodle making machine, please contact with us.